Amid ongoing controversy over its killer whale shows, SeaWorld Entertainment Inc. reported a 13% drop in attendance for the first three months of the year. The attendance numbers were included in a notice to the Securities and Exchange Commission that SeaWorld was buying 1.75 million of its own shares from Blackstone Group. The notice said attendance for the three-month period that ended March 31 dropped to about 3.05 million visitors from 3.5 million in the same period in 2013. In previous reports, SeaWorld officials noted that attendance numbers may change with the shift of holidays in the calendar. Easter, for example, took place in the first quarter of 2013, but in 2014 the holiday falls in the second quarter. The Orlando-based theme park company has been under scrutiny by animal rights activists following the release last year of a documentary film, “Blackfish,” that suggests the parks mistreat their killer whales. A spokesperson for SeaWorld could not be reached for comment. But during a conference call last month to report 2013 financial results, SeaWorld officials rejected suggestions that the company is suffering because of a backlash from the film. For the year, attendance at the company’s 11 parks dropped by 4.1% to 24.4 million, but the decline was offset by higher admission prices and greater in-park spending. SeaWorld officials instead attributed the attendance drop to a rise in theme park ticket prices last year. 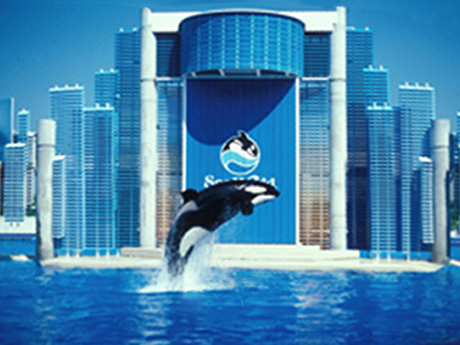 Blackstone bought SeaWorld Entertainment from Anheuser-Busch InBev for $2.3 billion in 2009. Blackstone launched an initial public offering of the company last year. The repurchase of SeaWorld shares coincides with the sale by Blackstone of 15 million shares in an underwritten offering. Blackstone’s stake in the company will eventually drop to about 25%, according to filings. Attention, attendance is down at SeaWorld. All you nae-sayers , those who support SeaWorld despite the growing momentum to restrict what sea animals they can use, need to be aware that people are voting on this issue with their feet. cat, good point, but the Great Recession has been going on for a while now – so, why now is attendance down? I don’t think so. As bad as things may be (economy), if what you’re saying is the case then attendance would have been down several years ago. I think the decline in attendance mostly due to information about what goes on behind the scenes, bad economy or not. There are plenty of other entities doing just fine as far as people spending their money on entertainment.